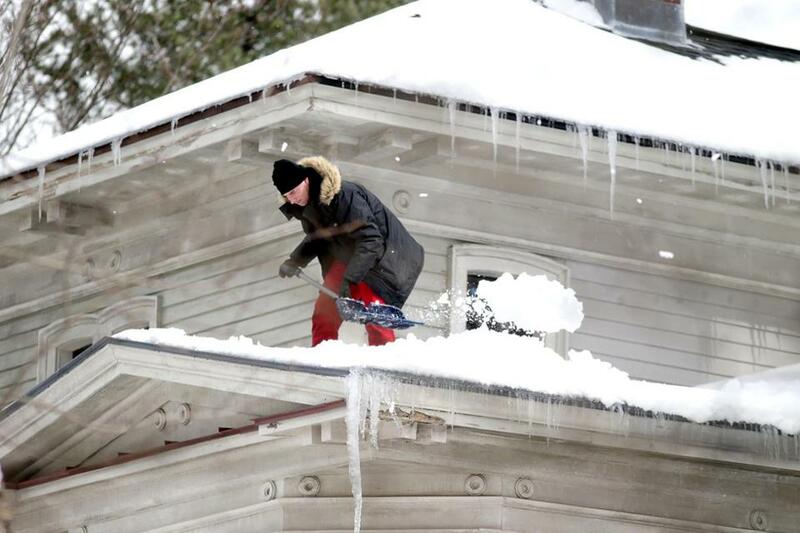 A man cleared snow off his roof in Sudbury last week. The National Weather Service is predicting that the Boston area could see up to 10 inches of snow from a storm expected to hit the region Wednesday. A winter storm watch has been issued for much of Massachusetts through 8 Thursday morning, and a coastal flood watch has been posted for communities south of Boston, including Cape Cod and the Islands. 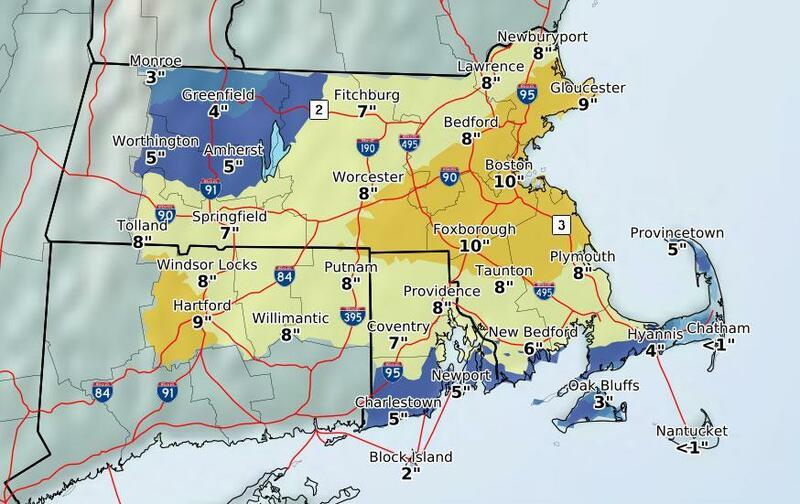 Forecasters now expect Boston to get about 10 inches of snow from Wednesday’s storm. Commuters should expect some delays early Wednesday due to a light snow — perhaps 1 to 2 inches to start, said National Weather Service meteorologist Bill Simpson. By mid-morning, heavy, wet snow is expected to accumulate, which could result in a total of 6 to 10 inches in the Boston area. Drivers should beware of hazardous travel conditions on Wednesday evening, officials from the Massachusetts Emergency Management Agency said in a press release. Between 10 and 12 inches of snow could fall in Worcester, Middlesex, Essex and Norfolk counties, while areas closer to the Cape could see between six and eight inches, MEMA said. Little snow is expected to accumulate west of Worcester. The current cold spell seems balmy compared with the coldest four-day stretches recorded in Boston that began on March 17 or later. Minor flooding around coastal areas is likely on Wednesday, especially in towns like Duxbury and Quincy where seawalls have been damaged by previous storms, Simpson said. More moderate flooding is likely early Thursday morning during high tide, when storm surge could reach 3 feet near Cape Cod, officials said. Winds could also approach 50 miles per hour along the coast on Wednesday. “Unfortunately with the heavy, wet snow, that means power outages are certainly possible,” Simpson said. The snow is expected to taper off Thursday morning, Simpson said. The region is expected to see cold temperatures for the next two weeks, meaning the snow could stick around for a while, he added. 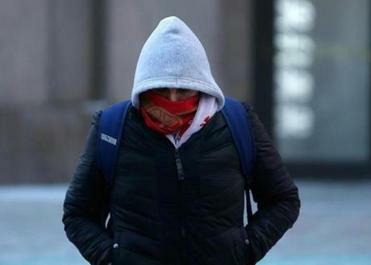 Lows are expected to be in the 20s overnight Monday into Tuesday in Boston, said Kim Buttrick, a meteorologist with the National Weather Service. Temperatures in the suburbs will be a few degrees cooler. Abigail Feldman can be reached at abigail.feldman@globe.com. Jeremy C. Fox can be reached atjeremy.fox@globe.com. Follow him on Twitter @jeremycfox.